Salads in winter aren't always the easiest or most intuitive thing, at least for those of us who like to turn to a simple tossed green salad on the regular. The greens that are in season are either tougher greens that generally respond better to cooking than being eaten raw or bitter greens that aren't everyone's cup of tea in a salad. This Endive Kumquat Salad is the perfect end-of-winter, spring-is-almost-here salad—it's just bright enough to give you hope for spring. 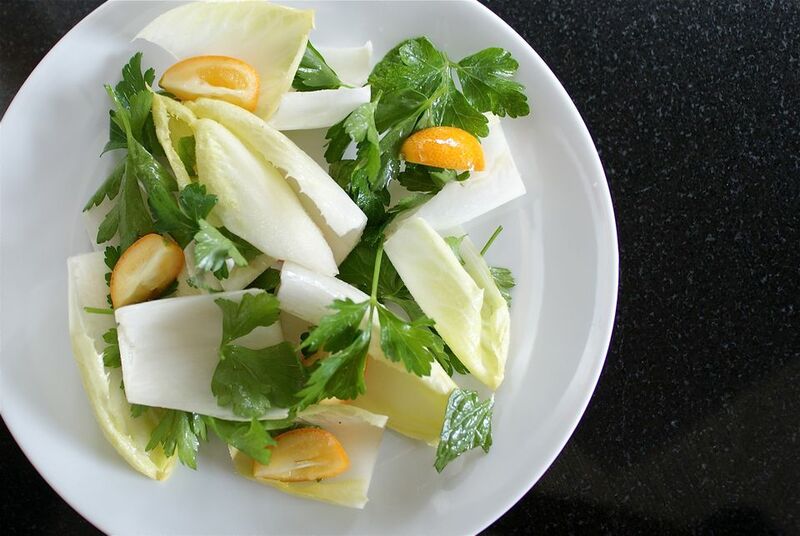 Yes, it features bitter Belgian endive, but the bitterness of the crunchy leaves is tempered by the sweet-tart bite of kumquats, tenderly sweet mint, and a bright lemony dressing. Plus, the bitter endive and tart kumquats are the perfect offering after heavy roasts and stews. Cut off any browned ends on the endives, cut the trimmed endive into bite-size pieces, and put them in a salad bowl. Alternatively, you can serve the salad with whole leaves—simply pull the leaves apart, cutting off the stem end as needed to free the leaves apart. Pinch the leaves off the parsley and mint sprigs. Discard the stems. Tear the leaves into smaller pieces and add them to the endive. Or, stack the mint leaves and use a sharp knife to cut them into thin ribbons. Cut the kumquats lengthwise into quarters and add them to the salad. In a small bowl, whisk the lemon juice, oil, and salt. Drizzle this uber-simple dressing over the salad. Toss the salad to coat everything evenly with the dressing. Serve immediately. Add a teaspoon or two of honey to the dressing for a sweet edge to the entire salad (it helps tame the bitter bite of the endive, too). Use berries—raspberries are a particularly good fit—in place of the kumquats when the season changes. Really don't like bitter greens? Just use peppery arugula in place of the Belgian endive heads. If you happen upon limequats or other small, fully edible citrus fruits, use them in place of the kumquats. Fruit vinegar is an excellent substitute for the lemon juice if you want a less sour dressing. Add more herbs if you have them—chervil and dill are both good choices for this spring-might-have-just-sprung salad.